Hey Baby It's Time to wake up! My favorite clock is by far the clock I have come to call "The Hey Baby Clock" and for ten years I have yet to find a clock that is as ingenious, adorable and as durable as the "Hey Baby". It was really by sheer chance how I landed my clock. When I was younger-my mother, brothers and I were walking through the mall and we came upon an adult novelty store which my mother didn't approve us going into. But in the front of the store sat a sale table and on the table was the clock. We would have never known what the alarm sounding was like if my younger brother wasn't as ADD as he was. Needless to say, we all loved it! When we went to check out, my mother realized she had left the checkbook in the car and when we came back the clock was gone! We tirelessly searched for months to find the clock, but to no avail. Then one day, we just happened upon it at a linens store and since then I have not let go of it. The clock itself looks somewhat like a child's clock. 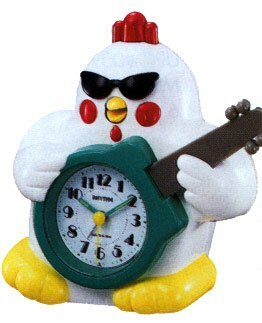 It is of a chicken, wearing black sunglasses and holding a blue guitar and within the body of the guitar is an actual clock. But, its appearance wasn't what made me fall in love, it was the alarm. Every morning for the past ten years I have been awakened by the sound of my "Hey Baby" clock. It has yet to get old to me. "Hey baby, its time to wake up, come and dance with me, come and dance with me." The beak of the chicken even moves as if it were singing along with the song. It's a happy, light and cherry alarm to wake up to and it sure beats the monotonous noise of regular alarm clocks. Not only is it just an awesome clock but it has lasted for years. I LOVE my clock, it's great. I've bought at least five by now for nieces and nephews and as birthday gifts for my friend's children. It's really appropriate for any age and to be honest I don't think I could wake up without it. Comments for Hey Baby It's Time to wake up! I had one of these in the 90s! First loved it, then hated it... Incredibly sturdy beastie - as an irresponsible student that frequently stayed out too late I took to switching the alarm off by throwing it across my bedroom in the mornings... never stopped working though!! I think I gave it to my son when he was quite little, don't know what happened to it after that, but I think I'm sending my husband up into the loft to look!! I'm lookin for one also! i had mine in high school in the late 90's. My family all hated it becuz it didnt just wake me up, it woke up everyone in the house. Mine was a little different, it didnt say "it's time to wake up" it said "Hey baby wake up, come and dance with me, woooooooow, yoooooow" then it would repeat it again and again until you pushed the button on top of his head. the only bad thing about this clock was that it didnt have a snooze button, once you turned him off he was done and you had to remember to push his button back on for the next morning. Regardless, he was awesome, i had him for years then he stopped working. my niece was only a toddler when i had it, now she's 16 years old and she still remembers it. i wanted to buy her one and myself one also. if anyone has found them for a reasonable price please let me know. i think my dad paid $10 for mine back then. I just bought this clock on e-bay for my Fiance' I put it under his bed and set it for 7:30 sure enough it went off waking him up (scaring him) it was so funny especially when his dog starting howling to it. How much do you love this clock? My son had one years ago, but when I was cleaning out.... I gave it away!! To Goodwill, no less. Oh well! I have been looking and looking for this clock. If you find one, please email me at lecesnes8@yahoo.com. p.s. oh, and my email address is lmilam57@gmail.com if you would be so kind as to help me locate another chicken alarm clock :D I'm surfin the web for one. aw!! Mine simply quit working,and I chunked it after being unable to get anyone to fix it...now I'm sorry I did...sure would like another one. I got it for less than $10 about 10 yrs ago...NOT the high$ as reported by some who want to exploit it on eBay!! I also have been looking for this clock, my kids loved it years ago when they were little. What a neat gift for them now, to remember their childhood! Let me know if you know where to find them. The one I purchased then was from BestBuy. You said "I have bought at least five by now for nieces and nephews and birthday gifts for friends children." WHERE??????? I have been searching high and low for this clock for years!!!! We had one back in the early nineties, but it passed on to a better life several years ago. Can you PLEASE tell me where to get another one of these clocks???? My email address is emy31U@yahoo.com Thanks!!! !